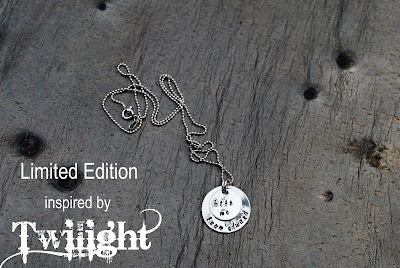 A brand new, limited-edition "Twilight" inspired necklace just for you! SO limited edition that you can only get it right here. The cost is $36 and it will stop being sold Friday, November 20 - the day "New Moon" finally hits theatres. Necklaces no longer available - thanks to those of you who snatched them up! Ok, I know nothing about twilight, but the necklace is still super cute!! love your work!